Growth of countries like India and China in a period less than two decades is double the rate of the growth of Europe and North America during the industrial revolution. Source: Reuters / Vostock Photo. The forthcoming Durban BRICS summit, one of the foremost advocates of this reform, would likely deliberate on Human Development issues and reiterate the collective resolve of the global south. The 2013 Human Development Report, released last week, admits that “the rise of the South is unprecedented in its speed and scale,” and “the South as a whole is driving global economic growth and societal change for the first time in centuries.” The contents of the report did not appear surprising as they reflect emerging global realities, though some of its usages of concepts might appear tricky as they can be subject to contradictory interpretations. The report titled “The Rise of the South: Human Progress in a Diverse World” harps on the urgency of a synthesis between the efforts of the global north and the global south, accommodation of the emerging south in international bodies and decision making processes, while at the same time digging holes in the development process of the south as, for the report, there exists glaring lacuna in the policies of the south. One of the highlighted points in the report is: “The South needs the North and, increasingly, the North needs the South.” Perhaps this is one of the major contributions of the report in pointing out the increasing symbiosis between the north and the south. Three major drivers of economic growth, as identified by the report, are: proactive development state, tapping global markets, and determined social policy innovation. The rising countries of the south has reflected in their working these drivers and as a result the growth of countries like India and China in a period less than two decades is double the rate of the growth of Europe and North America during the industrial revolution. The rapid growth of these countries and their rising prowess in groupings like BRICS and G-20 were marked by the vast markets in these countries, huge human resources, rise of the middle class, and increasing global connectedness in terms of trade and commerce. As a result of which, the report predicts, by the year 2020 the combined output of Brazil, India and China (the members of the BRICS) will exceed the combined output of the US, Germany, United Kingdom, France, Italy and Canada. The report estimates that out of the world’s total $10.2 trillion in foreign exchange reserves, the developing countries account for two-thirds. This has mainly happened due to trade between the developing countries, which has risen from less than 10 percent to 25 percent of total world trade within last three decades, while the trade has been reduced from 46 to 30 percent among the developed countries. The report points out the discrepancies between the aspirations of the rising south and the existing mechanisms of international decision making. India will soon be the most populous countries of the world but without adequate representation in international bodies. India’s quest for a permanent member of the United Nations Security Council assumes salience in this context. India along with Brazil, Japan and Germany has been lobbying for a permanent membership at the Security Council but due to the great power politics, this has not been materialized. Though India’s traditional friends like Russia has expressed unequivocal support for this quest, other permanent members appeared to have different policies in this regard. The report also points out that despite China’s stellar growth in the past decades and as being the second largest economy in the world, it has only 3.3 percent share in the World Bank. Similarly the growing Africa with population at about one billion has not been adequately represented in international bodies. The changing equations in international politics due to the rise of the south have undoubtedly altered the existing operational structure and power play among the nations. The report apparently focuses more on economic and related dynamics, rather than on the impacts of economic growth on political dynamics among nations. 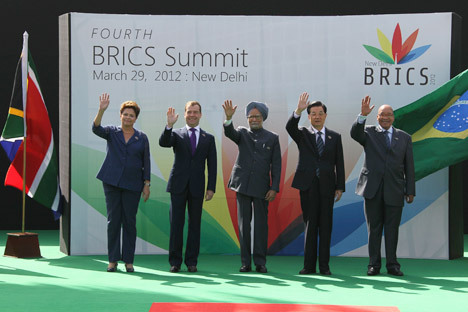 Can the BRICS rule in a world without the West? One novel feature that can be found in the report is its formulation that “There is a ‘south’ in the North and a ‘north’ in the South.” This is an allusion to economic discrepancies within the developed and the developing countries. The report points out that despite rapid growth of the countries of the south, the countries’ suffered enormous gaps in their polity, economy and society. It emphasizes on the concepts of enhancing equity, enabling voice and participation and managing demographic change. In India, the report estimates that there are 612 million people (about 50 percent of India’s population, and about 40 percent of the world’s poor) suffering from ‘multidimensional’ poverty. The introduction of this term ‘multidimensional’ has received criticism as it can be subject to differing interpretations. The concept of ‘multidimensional’ appears ambiguous, and on this parameter there are more poor people in India than in any other country. On the other hand, the report observes that India’s investment in tertiary education, building human capabilities and opening up to trade and investment led it to grow fast with having positive impact on the population. One critic comments that it is like sugarcoating the growth story of the countries of the south and then lampooning the imbalance in these countries. The emphasis on managing the distribution of global public goods or confronting environmental challenge or creating joint stakes in global affairs indicates that the report, written under the auspices of the UNDP, vindicates willingness on part of the nations to work for a new world order in which the older structures no longer dominate the global politics. Already emerging global bodies like the BRICS and G-20 have synergized their activities to reform the international political processes. The forthcoming Durban Summit of the BRICS, one of the foremost advocates of this reform, would likely deliberate on these issues and reiterate the collective resolve of the global south. The Human Development Report since its inaugural issue in 1990 has done an exercise in bringing out economic growth stories and gaps therein in developing and developed countries. Initiated by the Pakistani economist, Mahbub ul Haq and assisted by economists like Amartya Sen, the report attempts to evolve a global consensus towards sustainable economic growth. The 2013 report was written under the leadership of another Pakistani economist, Khalid Malik. Though the methods in preparing the report have been questioned in some quarters, the report has been referred by policy makers around the world. The report also develops a Human Development Index, based on comparable data on education, health and income, and ranks countries as per their performance. This year the report studies 187 countries. Among the members of the BRICS, while Russia remains at 55 rank, Brazil, India, China and South Africa remain at 85, 136, 101 and 121 respectively.